Mediterranean agroecosystems are particularly vulnerable to soil degradation, and alterations in ecosystem services need to be predicted using appropriate approaches. In the present work, we perform an integrated assessment of soils under different long-term management practices—tillage vs. covered soils—under semiarid conditions by using a complementary soil biochemical, genomic, and transcriptomic approach. Dehydrogenase, β-glucosidase, phosphatase, urease and arylsulphatase activities were determined, as well as both overall and metabolically active bacterial population number and community structure. In addition, this is the first report linking β-glucosidase activity with genes encoding bacterial β-glucosidases in soil, a key enzyme involved in soil–carbon cycle. 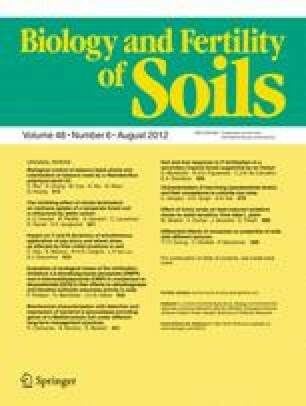 In our work, data on bacterial biomass or β-glucosidase gene copy number has provided no additional information regarding the effect of management or profile depth on soil bacteria behaviour other than those derived from traditional biochemical methods measuring overall microbial activity potential. Nevertheless, a different trend resulted when gene transcripts were considered pointing to the relevance of using RNA-related properties as sensitive indicators of bacterial physiological state in semiarid soils. The results evidenced the influence of management and soil depth on the expression of bacterial β-glucosidase genes, which was by no means related to available C-nutrients. The results also pointed out overexpression of ribosomal RNA genes in tillage soils. This fact was not an indication of higher bacterial biomass but probably the response of the bacterial community to stressed conditions. Consequence of this would be the positive effect of spontaneous cover crops on soil biological stability, where bacterial metabolic expense was much lower. Rosa Cañizares and Beatriz Moreno contributed equally to this work. The online version of this article (doi: 10.1007/s00374-012-0663-8) contains supplementary material, which is available to authorized users. This work was supported by ERDF-co-financed grant CGL2009-07907 from the Spanish Ministry of Science of Innovation. R. Cañizares is supported by the JAE-CSIC predoctoral Program. We would like to thank David Nesbitt for the valuable English editing on the latest version of the manuscript. Finally, we would also like to thank Prof. P. Nannipieri and two anonymous reviewers for their helpful comments that greatly improved the manuscript.